Here’s a summary of my recent 'experiments' (a.k.a. 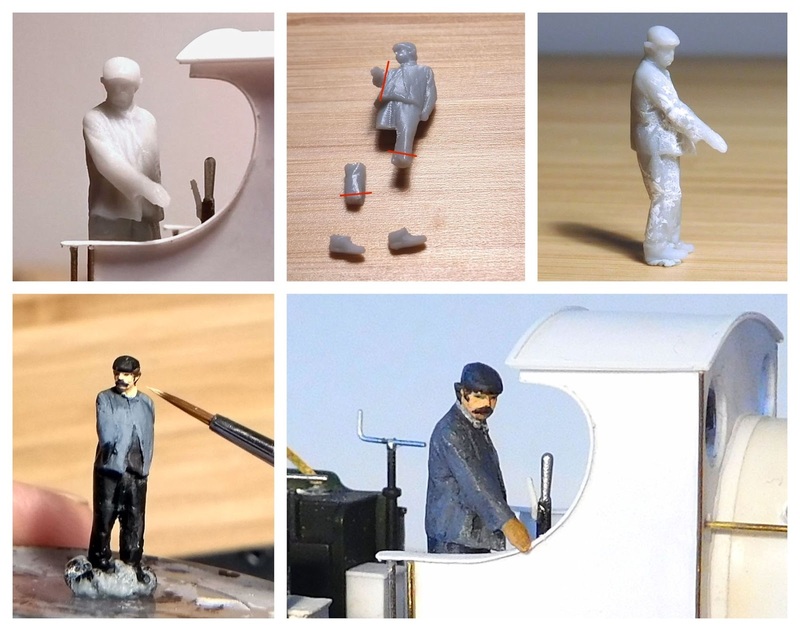 mucking about) with Modelu and other 4mm figures, and how to store them. I have previously modified figures from the Andrew Stadden, Dart Castings and Preiser ranges. So obviously, the Modelu range had to suffer too! 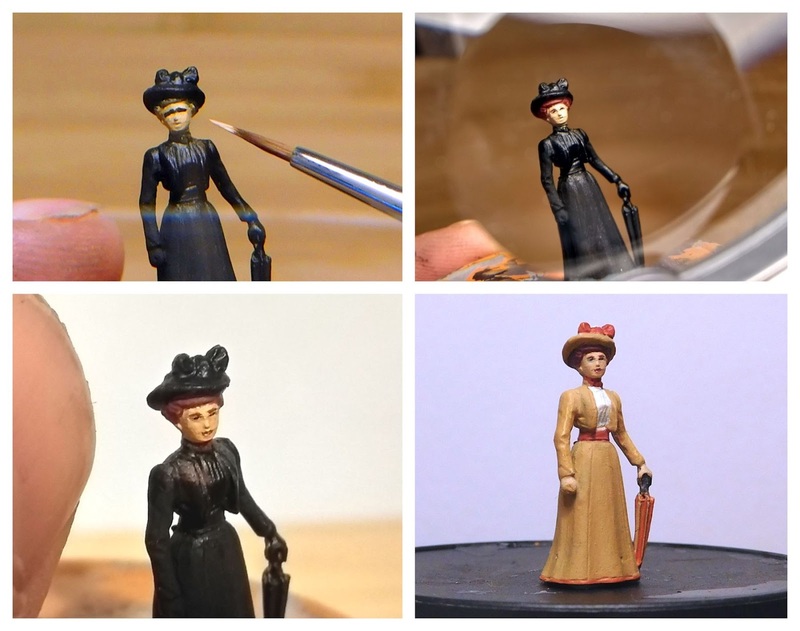 The resin used in these figures cannot be bent (it will break), but clean cuts with a scalpel worked OK. Joins were sanded, fixed with superglue and smoothed out with putty. Not everyone will think it’s worthwhile, but I find it relaxing and you get quick results. The driver above was shortened and had his feet repositioned to fit in the cab of my Dean Goods. 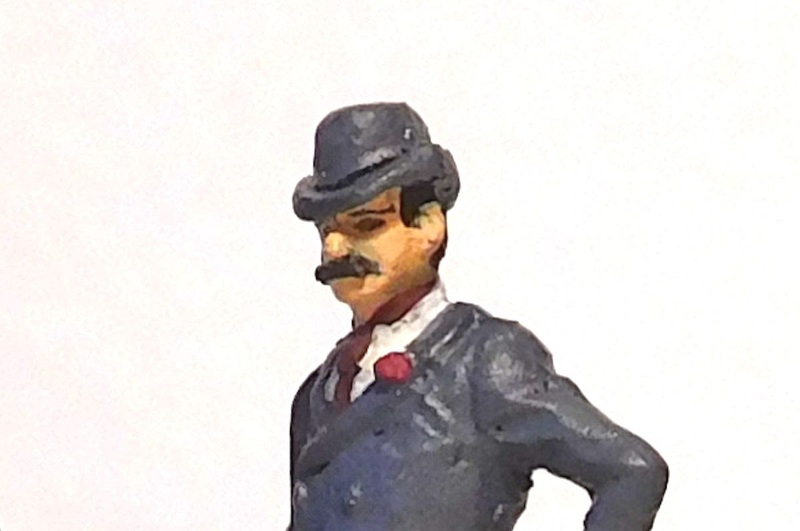 Another driver had a head fitted from an Andrew Stadden figure, in order to enhance the Edwardian look. 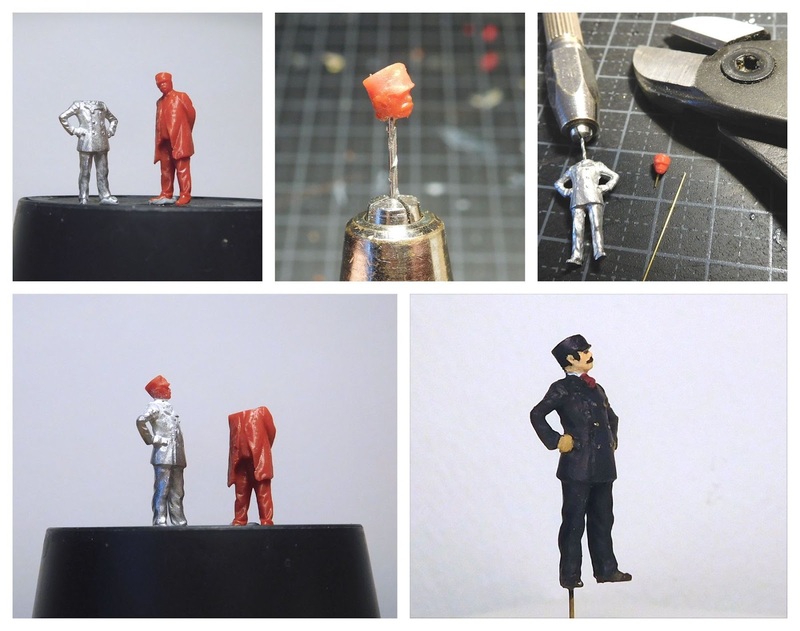 That left a headless Andrew Stadden body, so a head was transposed from a Modelu station master who I felt looked a bit too modern for my Edwardian period. I have also been experimenting with painting, especially those difficult eyes. The pro painters do some amazing work in this respect, but as a mere mortal I’m just looking for a simple way to achieve a rough indication of eyes without spending too much time on it. The approach illustrated above has helped. First, two black stripes across the eyes. The stripes can then be narrowed and shortened by painting skin colour carefully around them. I find this much easier than trying to paint the eyes directly. The same technique can be used for the eyebrows and mouth. Eyebrows can be tricky when hats etc get in the way, but do add character. I suppose the next step on the learning curve is to fill in those blank, black eyes. Not sure I'm up for that! 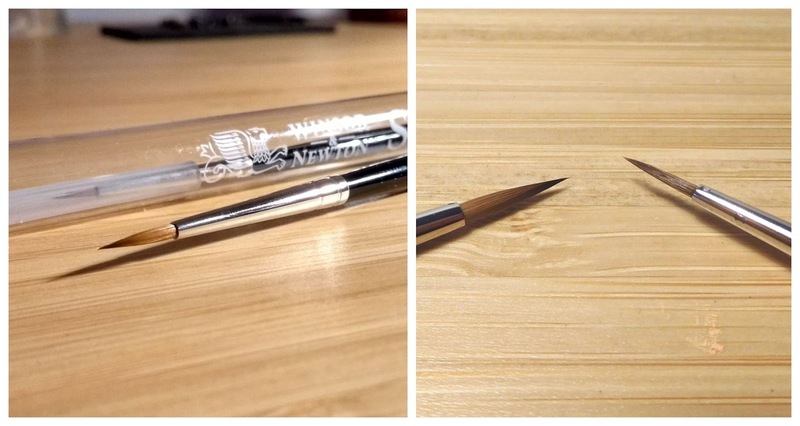 Reading up on brushes led to the purchase of these Windsor & Newton Series 7 brushes (not the “miniature” range). The sizes are 00 for faces (right), and 1 for larger details (left). These are bigger sizes than I have normally used. This is based on online advice from pro painters. The theory is that larger brushes give better control and the paint doesn’t dry as quickly on the way to the face. If you look closely at the lady above, you can see that her face isn’t quite smooth, because I let the paint become too dry on the brush. A larger magnifying glass has also helped, although I’m still struggling a bit with the weird hand-eye coordination that this requires. The field for extra magnification is useful and tells me that it may be worth investing in an even stronger glass at some point. As we now live in a flat I have to pack away the layouts in-between operating sessions. This has led me to consider how to store the figures and other fragile items. If stored too casually the paint easily chips, noses are flattened or accessories break. 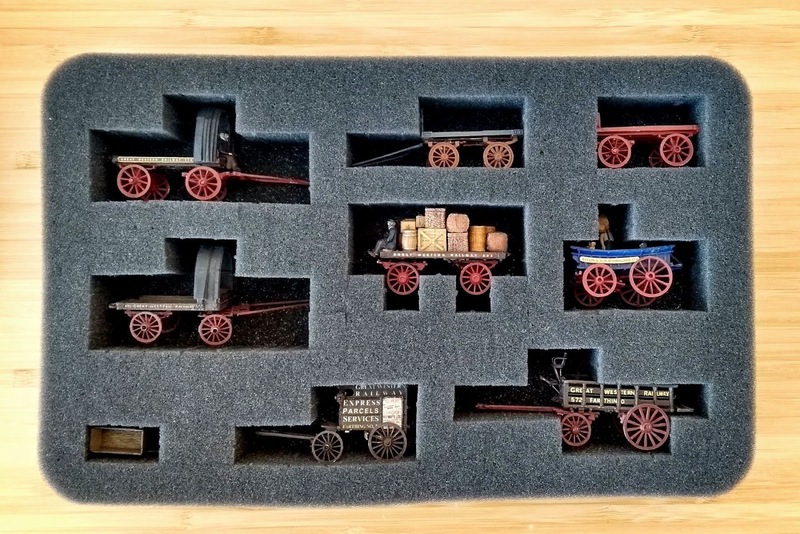 So, inspired by Chris' storage box for figures, I had a look around the web and came upon “pick and pluck” foam trays. 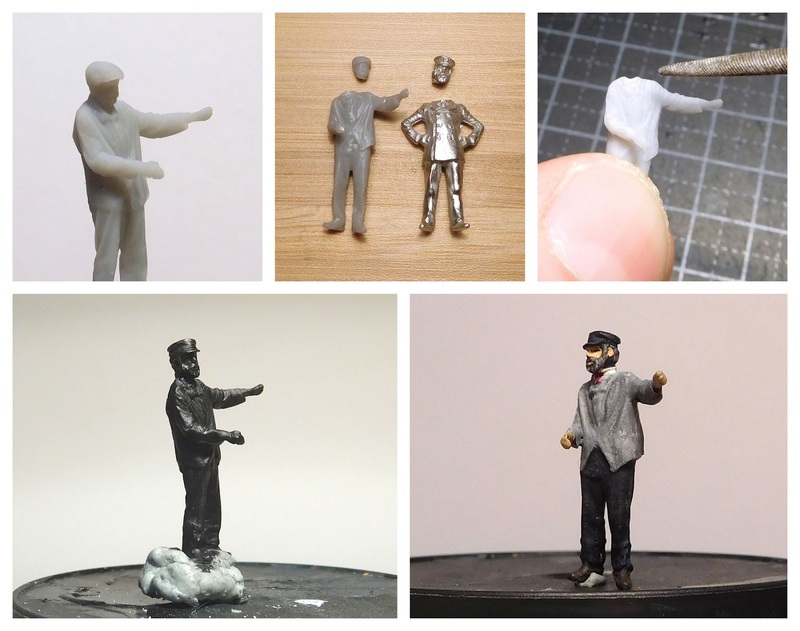 These are available on ebay, or from military modelling manufacturers like Feldherr. After plucking out the foam as desired, a base layer is added, and the tray is ready to use. The foam trays come in different thicknesses, this is 15 mm (0.6 inch) plus a base layer. For my horse drawn wagons I used 30 mm (1.2 inches). In retrospect it would have been better to go for something even deeper so the wagons could be placed upright. …and fitted in an appropriate box. This is just a shoebox. I added an extra protective layer of foam on the top. 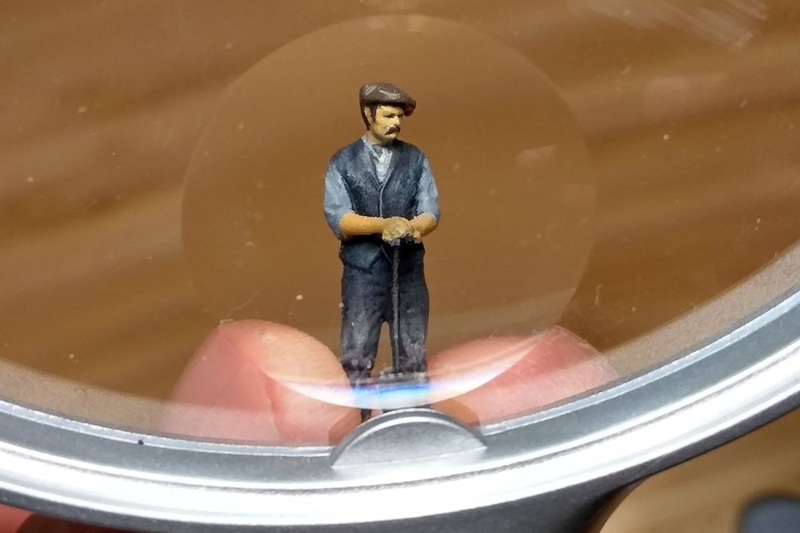 In order to handle the figures, I fitted a bit of felt to a pair of old tweezers. Having made the trays you end up with a lot of foam cubes that are supposed to be discarded. This seemed wasteful so I decided to use the cubes for making additional storage boxes for my “second-tier” stuff. They have a sticky underside so it’s very straightforward. The box is a takeaway food container. Ever since Northroader pointed out the usefulness of takeaway boxes we have been eating a lot of Thai food! ...and fitted in yet another takeaway box (Phat Kee Mao, if I remember correctly!). ... and the boxes stack up nicely.